We had developed a habit of making our own pizza on Mondays for ourselves. Sometimes we would invite specific people over, but for the most part just the two of us enjoyed the pizza. Then we asked each other, what would happen if we invited anyone and everyone to come join us? With that, Pizza Mondays were born, with this basic premise: On Monday evenings, we make homemade pizza and we invite people to come and eat it with us. Anyone is welcome, and we usually make an announcement on social media the night before. And then we wait and see who God brings. Each week is different. Sometimes two people show up, other weeks 12 show up. I remember one week where it seemed that our basement gradually got more and more packed the later the evening went on! 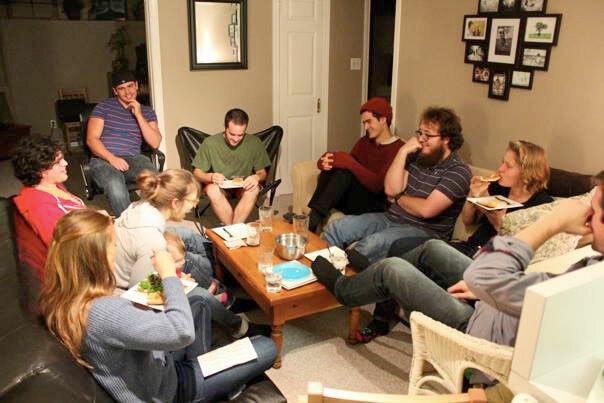 That particular night we had an enlightening inter-generational conversation about living in intentional community. Another night, we got into a deep conversation about some profound and critical questions regarding Christian faith. Most nights we just sat together and played board games. It is interesting that no matter what happened, no matter who came, we always seemed to have enough! On one occasion we had one of our guests run to the grocery store to get some additional food, but I never remember anyone leaving hungry. Some people would bring toppings for the pizzas, others would bring some food they had that they wanted to contribute. We have friends who live in downtown Hamilton who were inspired to start their own Barbecue Mondays variation last summer, and invited their neighbours to come out. What is Pizza Monday? It doesn’t really fit into a category. It’s not really a potluck, it’s not a Bible study or small group or church event, nor is it just a social gathering. I like to think of it as a place where community gathers, where food and hope are shared, and God is glorified. It’s not rocket science. It’s merely making pizza and inviting people to join in! Feature story: "Pulling the curtain of hope over fear"
Companion sidebar: "Potluck picnics in the park"